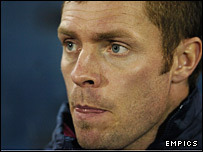 Sheffield United have been told they cannot go back on an agreed deal with West Brom on Geoff Horsfield. The 32-year-old striker wants to end a loan spell at Bramall Lane but the Baggies say he will not be going back. A club statement said: "We have made an agreement with Sheffield United for a loan until the summer and a permanent transfer for an already agreed fee. "That deal will stand unless United can find an alternative club to take on their responsibilities." Horsfield moved to Bramall Lane only a month ago and was set to stay until the end of the season. However, he has failed to make much of an impression under Neil Warnock as he has made just one start and two substitute appearances for the Blades. He and Warnock had agreed to try and find a way out of the deal with West Brom, who signed the centre forward from Wigan for £1m in December 2003, but that now looks impossible. The Blades have seen their promotion bid wobble in recent weeks and slipped to a 2-1 defeat at Norwich on Saturday.